Costa Diadema, the future flagship of Costa Cruises, today touched water for the first time during the technical launch ceremony at the Fincantieri shipyard in Marghera. Costa Diadema (132,500 gross tonnage and 1,862 guest cabins) will be delivered on 30 October 2014. 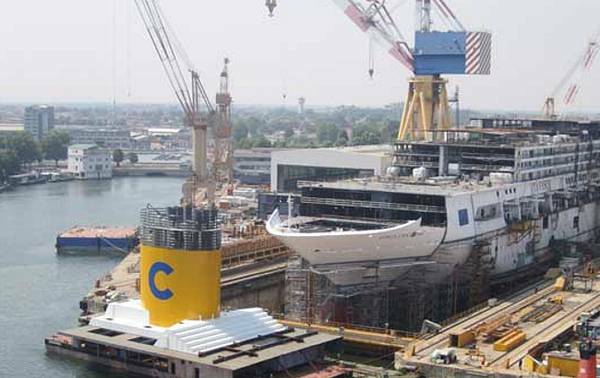 Costa Cruises has invested a total of around €550 million in her construction and the project is employing approximately 1000 shipyard workers plus another 2500 employees of allied industries. The benefits in terms of employment extend beyond the yard, especially regarding the fitting-out of the interiors of the cruise ship, with the involvement of about 400 contracted suppliers, most of which are Italian firms. Fincantieri’s CEO, Giuseppe Bono, commented: “For many years now we’ve been applying Italian know-how to form a winning team with Costa. We hope that the country as a whole is proud of these two major companies and will not fail to support their continued growth. We’re also convinced that Costa Diadema, the largest ship ever built for Costa Crociere, bodes very well for the future development of our companies and the entire industry”. 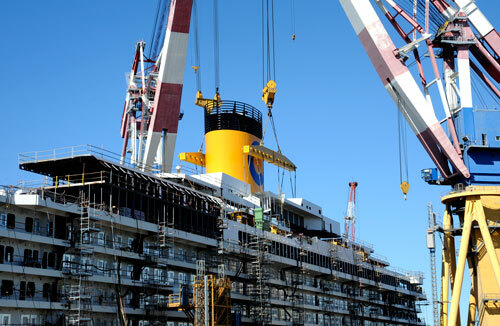 Costa Diadema’s technical launch ceremony was carried out according to seafaring tradition. The launch started with the welding of a coin at the base of what was once the mainmast, a custom considered to bring good luck. Shipyard director, Antonio Quintano, then invited the godmother, Ms. Franca Grasso, to cut the ribbon and break a bottle of champagne against the bow. Once the dry-dock basin where the ship took shape over the last few months had been filled with water, the hull finally touched the sea for the first time. Highlighting the strong link between Costa and its guests, Franca Grasso is a member of the CostaClub (Costa Cruises’ loyalty club) coming from Giarre (Sicily), who was chosen through a selection on board Costa ships cruising in the Mediterranean Sea at the end of October and beginning of November 2013, involving over 12,000 guests. 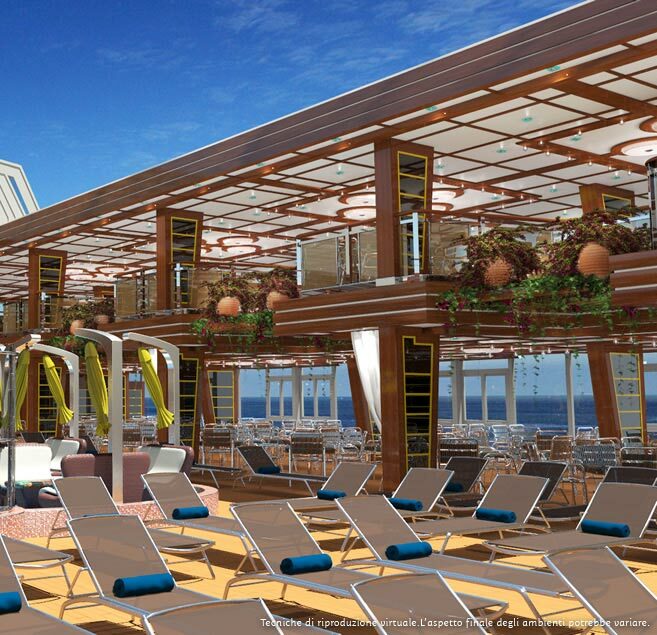 Costa Diadema’s features will be comfort combined with top quality food, wine and entertainment. The new flagship’s interiors will be even cosier, roomier and more modern in terms of facilities and layout of her public areas. Costa Diadema will offer large, split-level rooms directly overlooking the sea and conveniently interconnected. Among the many innovations on board are new food and wine tasting treats in the shape of the Vinoteca, Birreria (beer house), Japanese Teppanyaki, Pizzeria in Piazza Pizza and Gelateria. There will also be new forms of fun and entertainment on board with the advent of the Country Rock Club, the place to go for classic rock music, and the Star Laser room featuring different styles of interactive laser games including the Laser Maze. The Portobello Market Piazza, at the heart of a 1100m2 area consisting of designer stores and retail outlets, will appeal to shopaholics, while those who enjoy the sun, sea and spectacular ocean vistas will enjoy the open-air promenade and cabanas. Meanwhile, the purpose-built Samsara Spa on three levels, located on the upper decks, will offer the rejuvenating experience of a wellness cruise. In Winter 2014/15 Costa Diadema will be deployed on a one-week itinerary including the chance to visit two of Italy’s must-see cities – Rome and Florence – on one cruise. The port calls are Savona, Marseille, Barcelona, Palma de Mallorca, Civitavecchia and La Spezia.